One of the most difficult kiln performance problems to address is a problem with the electrical supply to the kiln. The apparent symptoms might be an Error 1 (E1), sluggish heat up, or poorly fired work. Kilns are designed to operate at particular voltages. Typically (in the US) this is either 240 or 208 volts although it can be 480 volts (mostly industrial) In many non-US locations 380 volts/220 volts is common. Just because a circuit box is labeled for a particular voltage does not mean it can deliver that voltage consistently. A kiln is a large resistive load that will pull a lot of electricity. When you turn the kiln on the voltage will decrease. Voltage can be compared to water pressure. Imagine a water hose that is full where the nozzle is turned off or down. There is lots of pressure in the hose making it rather stiff. As soon as you open the nozzle the hose goes slack – because the pressure goes down. In the same way when you turn on the kiln chances are your voltage will drop. When the voltage drops the amperage and wattage (power output) will also drop. That means the kiln will get less power than it was designed to get. Most of time this is not a problem because there is usually enough reserve built into both the kiln and the power supply. However the kiln condition, its load, and the maximum desired temperature coupled with a power supply issue can cause a performance drop that creates a noticeable problem. Some kilns are underpowered because of limitations imposed by various constraints. The most common is that of a 10 cubic foot kiln like the e28T-3 or any other similar 10 cubic foot kiln that is designed to work on a 60 amp circuit. The 60 amp circuit is a common limitation because they are so commonly available and the cost of making a kiln over 48 amps (the maximum full-load amps for a 60 amp circuit) changes the price of the kiln significantly. So, for instance, an e28T-3 rated at 240 volts is nominally listed for Cone 8 operation and an e28T-3 rated for 208 volts is nominally listed for Cone 5 operation. Those limits assume a good voltage supply and an average load of no more than about 75 to 100 pounds. The point is that with some kilns you will be operating on the edge. Under some conditions it will not perform well and you may have to reduce the size of the load and/or reduce the temperature you are firing to. The other option is to get a kiln with a higher wattage rating like a JD2927-3 or an eQ2827-3 or change to a three phase kiln where you can get more wattage in a smaller amperage circuit. One of the first things to do is to switch to single zone control to make sure that all the available power is going to the kiln. Low or inconsistent voltage can be caused by several things. First of all you can usually see this by taking voltage readings of the kiln UNDER LOAD (while firing at full speed. To do this set up a Vary-Fire program with one ramp at 9999 (the fastest it can go) to a set point of perhaps 2000. Vary-Fire program #6 may already be set up this way so start by looking there. With the control panel open you can check the voltage of the incoming line at the terminal block. (This should be done by a person knowledgeable about electricity because you will be dealing with high voltages). If you have a problem with your power you will typically see a significant voltage drop of up to about 5% or sometimes more when the kiln starts to fire. You may even have low voltage when the kiln is not firing which is only exacerbated by the kiln load. In addition, there may be other major loads on that same root electrical circuit like big motors, air conditioners, pumps, other kilns, that may or may not come on while the kiln is firing and cause voltage drops that you do NOT see at a particular point in time. Be sure to investigate what other large electrical loads might be in the vicinity. In addition, at certain times of day (like around dinner time) or in certain seasons (like summer) the entire electrical grid can experience a voltage drop. This can compound whatever issues you may have or may be the root cause of your problem if it is bad enough. Some electricians will tell you that the power grid is supposed the work within a certain range of voltages. This is true in general and generally applies well to motors. Large resistive loads like kiln are unusual and, for some kilns a voltage drop of 5% will be a problem. Long runs of wire from the circuit breaker to the kiln, especially if the wire thickness if just adequate can be a cause of problems. One of the unusual aspects of a kiln electrical load is that it may be pulling full amperage for a long period of time. The thinner and longer the supply wire to the kilns, the more resistance to electricity it has. With a large resistive load this can actually cause the wire to heat up somewhat – not necessarily enough to be a hazard but enough to reduce the amperage carrying capacity (called ampacity) of the wire. This can cause a voltage drop at the kiln. Another place that needs to be looked at is the circuit breaker that feeds the kiln. If you have one of those inexpensive infrared thermometers check the temperature of the circuit breaker. If it is hot the wires going into it may be loosely connected or the circuit breaker itself might be bad. 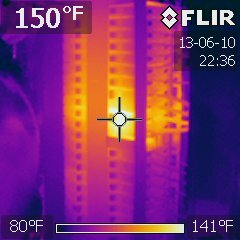 See the infrared photo in this post to see an example of what can happen. Some electrical supply systems have what is called a tap transformer supplying them. Your facility manager or electrician may be able to turn up the voltage by changing a tap. Be careful not to turn it up too much – and be sure to test the voltage and the amp draw on the kiln before proceeding to operate the kiln. Another solution is to install a buck-boost transformer on the kiln circuit. Lets say you have only 195 volts coming into the kiln circuit (under load) and you want 208 volts. You could get a transformer that will boost the voltage form 195 to 208. Sometimes low voltage is enough to heat the kiln up but causes the control to misbehave. For instance 195 volts will not provide the proper voltage to the control. If you are firing a light load to a low temperature, however, you may have enough wattage to do that. There is an easy solution for this problem. You can get a 120 volt separate cord to feed the control transformer. The control transformer that we use has two inputs. One is 240-208. The other is 120. You attach the cord to the 120 volt inputs and plug that into a 120 volt outlet. You can even go one better and get a decent batter UPS computer power supply (cost of about $100) and plug it into that. That can solve other things like intermittent power outages, power supply spikes, electrical noise, etc.